Compiled by: Robert Hedinger. Series edited by: Roger M. Blench. 12 pp. Roman, 538 pp. Akoose is a “narrow” Bantu language spoken in the north-western most corner of the Bantu area and is classi­fied as Bantu A.15. It is spoken by approximately 130,000 speakers in the Bangem, Tombel and Nguti Subdiv­isions of the South West Region of Cameroon as well as in the Mungo Division of the Littoral Region. There is a considerable dialect variation between northern, southern and western Bakossi. For several reasons the south­ern dialect has been chosen to be represented in written form. The Akoose alphabet is in conformity with the General Alphabet of Cameroon Languages, which was adopted in 1979 by the National Committee for the Unifica­tion and Harmonization of the Alphabets of Cameroon Languages. 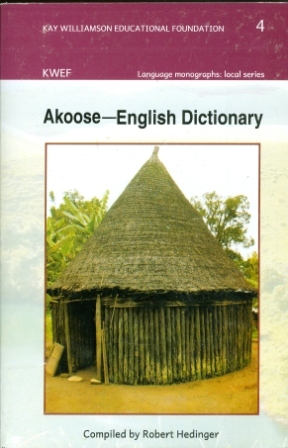 The dictionary is divided into two main parts: the Akoose-English Dictionary part which is the main section, and the English-Akoose Index part which is intended for those who want to find an Akoose word via the English translation. The main part contains the following: 6,400+ main entries, 1,300+ subentries, 7,600 definitions, 3,850+ example phrases and sentences, 400+ scientific names, 600+ variant forms, 650+ cross references, 450+ synonyms and antonyms, 200+ indications of the source of loan words, and 60 pictures. The index contains over 10,000 cross references from 7,500+ index items.